GROSVENOR PUMPS (India) is one of the ISO 9001-2008 certified leading Dosing Metering Pumps, Dosing Systems, Pulsation Dampeners, Chemical Process Pumps, Magnetic Sealess Pumps & Accessories manufacturing company in Mumbai - India. Grosvenor Pumps (India) is one of the ISO 9001-2008 certified leading Dosing Metering Pumps, Dosing Systems, Pulsation Dampeners, Chemical Process Pumps, Magnetic Sealess Pumps & Accessories manufacturing company in Mumbai - India. The Dosing Pump for Water Treatment Plantare made in India in Technical Collaboration with Grosvenor (UK) from the year 1996. Our company has an expertise in manufacturing of Dosing Pump for Water Treatment Plant.The pumps are tested in accordance with the API 675 International Standards. Grosvenor Pumps (India) is one of the ISO 9001-2008 certified leading Dosing Metering Pumps, Dosing Systems, Pulsation Dampeners, Chemical Process Pumps, Magnetic Sealess Pumps & Accessories manufacturing company in Mumbai - India. The Dosing Pump for Water Treatment Plantare made in India in Technical Collaboration with Grosvenor (UK) from the year 1996. Our company has an expertise in manufacturing of Dosing Pump for Water Treatment Plant. The pumps are tested in accordance with the API 675 International Standards. Gros venor Pumps (India) is one of the ISO 9001-2008 certified leading Dosing Metering Pumps, Dosing Systems, Pulsation Dampeners, Chemical Process Pumps, Magnetic Sealess Pumps & Accessories manufacturing company in Mumbai - India. 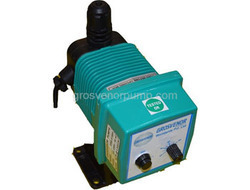 The Chlorine Dosing Pumps are made in India in Technical Collaboration with Grosvenor (UK) from the year 1996. Our company has an expertise in manufacturing of Chlorine Dosing Pumps.The pumps are tested in accordance with the API 675 International Standards.